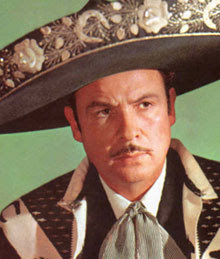 The Associated Press reports: Mexican mariachi singer and actor Antonio Aguilar, who recorded more than 150 albums and began his acting career during Mexico's "Golden Era" of cinema, has died in Mexico City after a long fight with pneumonia. He was 88. Born in the northern state of Zacatecas, Aguilar recorded with his traditional mariachi group for 50 years and sold more than 25 million records. His hit songs include "Triste Recuerdo," "Albur de Amor," "Gabino Barrera" and "Puno de Tierra." He appeared in 167 films, including The Undefeated starring John Wayne. In 2000, he got a star on the Hollywood Walk of Fame.